Gauri, the princess of Bharata, has been taken as a prisoner of war by her kingdom’s enemies. Faced with a future of exile and scorn, Gauri has nothing left to lose. Hope unexpectedly comes in the form of Vikram, the cunning prince of a neighboring land and her sworn enemy kingdom. Unsatisfied with becoming a mere puppet king, Vikram offers Gauri a chance to win back her kingdom in exchange for her battle prowess. Together, they’ll have to set aside their differences and team up to win the Tournament of Wishes – a competition held in a mythical city where the Lord of Wealth promises a wish to the victor. “A story had no owner ship. A story could break its bones, grow wings, soar out of reach and dive out of sight in the time it took just to draw breath. It meant we weren’t walking a cut path. 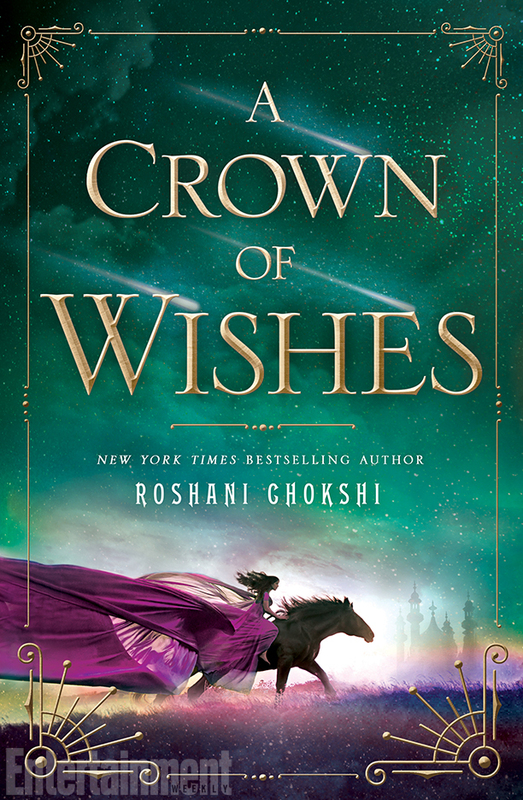 With Crown of Wishes, Roshani Chokshi once again transports us to a world woven by magic. Inspired by Hindu mythology, the narrative reads like a fable—the kind whispered around fire light, shimmering with didactic stories of wishes, desires, fears and betrayal. Every page comes to life with Chokshi’s poetic hand, as the princess of Bharata and the cunning heir of Ujijain embark on an unlikely adventure deep into the mythical corners of Alaka. We once again meet Gauri (Maya’s sister) who’s been betrayed by her brother, tossed into the clutches of a rival kingdom. For years she’s sharpened her physical and political skills, forced to play a deadly game to survive. But too much grinding has hardened her, despite her single mindedness to dethrone her brother and help her people. Meanwhile, Vikram struggles against the confines of his future—a puppet king at the whim of the Council. But when he receives an invitation to the Tournament of Wishes, hope flares for a different destiny. Before too long, Vikram offers Gauri the same hope, a chance for freedom should she agree to be his partner in the tournament. Finding the mythical city of Alaka (where the tournament is held) is only the first challenge. They must decipher clues hidden in riddles before they face unimaginable trials that will force them to confront their deepest fears and desires. And in a land of illusions and magic, death is almost certain with every step. With a slow-burning romance and danger at every turn, Chokshi’s beautifully written fantasy comes alive vibrantly. If you love poetic fairy tales with a dash of suspense and romance, this is one you shouldn’t miss.